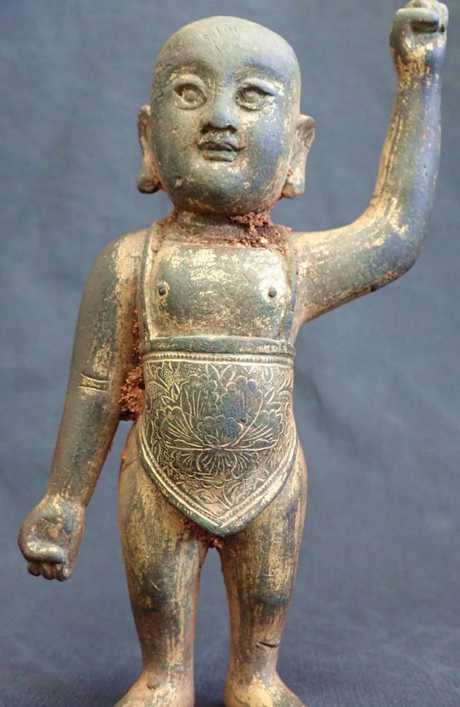 Was this Ming dynasty statue found in the sands of WA left by Chinese 600 years ago or is it a hoax? 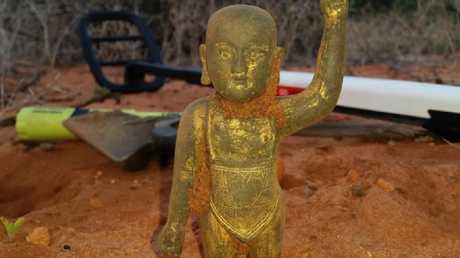 IS THE discovery of a bronze Buddha statue possibly dating back to the Ming dynasty in the sands of northwestern Australia evidence the Chinese visited and settled here 600 years ago? Or is the small, very heavy object, which one expert has dated back to the early 1400s, a mere hoax? 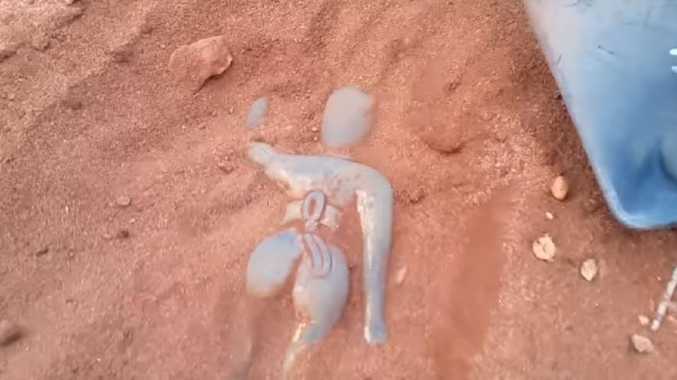 Two filmmakers and adventurers have claimed they found the statue on a remote beach in Western Australia's Gascoyne region. 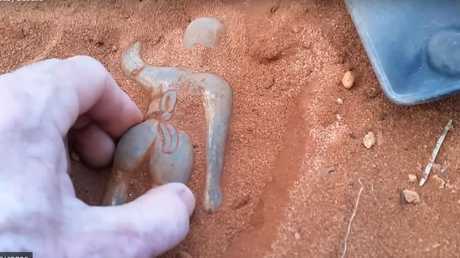 Leon Deschamps, a second generation historian and photographer from Shark Bay in the Gascoyne, captured the statue's unearthing with his Finn Films co-director and partner, Shayne Thomson. The men discovered the statue using metal detectors during filming for a documentary about the early 1800s French exploration of Australia. Deschamps and Thomson were looking for objects left behind during a Napoleonic-era voyage when they came across the Buddha, which weights 1kg despite its small size. They have now described the find as possible "evidence the 1421 Chinese Ming Dynasty 'Treasure Fleets' exploration of Australia up to two centuries before Europeans". Digging for Napoleon-era treasure, the Australian filmmakers found this Buddha which could date back to the early 1400s. Former Chinese president Hu Jintao claimed in a 2003 address in the Australian parliament that expeditionary Ming Dynasty Chinese fleets travelled to Australia in the early 15th century. 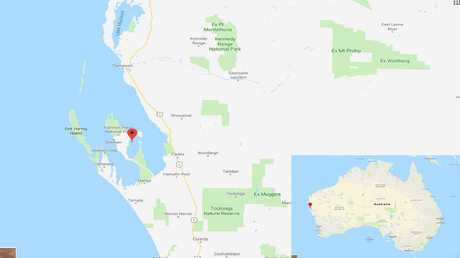 That is 350 years before Captain Cook, and more than a century before Willem Janzoon and Dirk Hartog reached Western Australia, the latter hammering a pewter plate at Shark Bay. English pirate William Dampier named Shark Bay after sailing there in 1699. "For centuries, the Chinese sailed across vast seas and settled down in what was called 'the southern land', or today's Australia," Mr Hu said in Canberra. "They brought Chinese culture here and lived harmoniously with the local people, contributing their proud share to Australia's economy, society and thriving pluralistic society." This hotly debated "fact" could now be laid to rest by the Buddha statue's discovery, Deschamps and Thomson suggest. 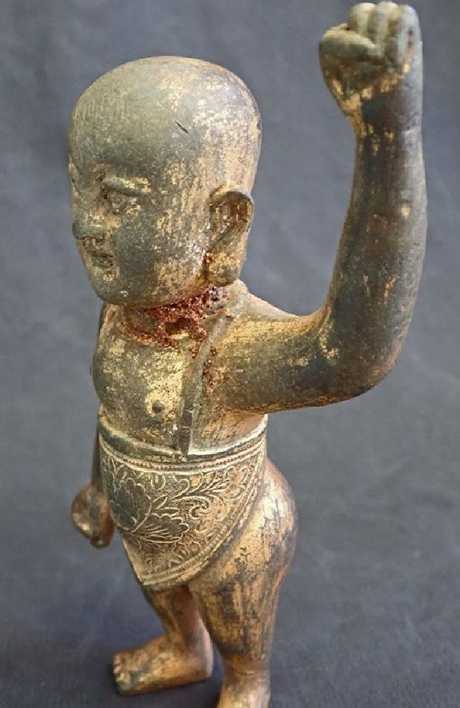 Sydney University China expert, Xiaohuan Zhao, said the baby Buddha appeared to be early Ming Dynasty, The Australian reported. Mr Zhao said the statue could date to the reign of either the Yongle emperor, from 1402-24, or the Xuande emperor, 1425-35, but it most likely came to Australia post-Ming dynasty. The baby Buddha weighs 1kg, despite its small size. However Notre Dame University archaeology and history lecturer Shane Burke said any claim a statue was brought from China to Australia in the Ming dynasty "should set off alarm bells". A former curator at Melbourne's Chinese Australian History museum, Paul Macgregor, told The Australian that even if the discovery was genuine it would not prove the Ming-era treasure fleets theory. "They could have bought something like that from an antique market or on a website," he said, adding Deschamps and Thomson had not provided evidence of the statue's authenticity. He suggested 19th century copies of Ming-style statues could have been brought to Australia by Chinese pearlers in the late 1800s or early 1900s. Thomson and Deschamps are having the statue "studied by experts", but said one "expert from overseas in Buddha statues" had already dated the statue from photographs as Ming dynasty. The Ming dynasty lasted from 1368 to 1644. The Chinese "treasure fleets", funded by wealthy and elite families, explored the world for minerals. 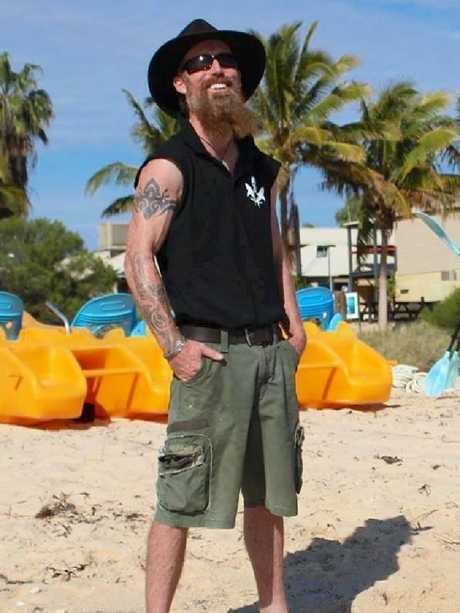 Claims they reached Western Australia, Queensland, New South Wales and the Northern Territory and built small villages and associated with Aboriginal people have been discussed, and mostly dismissed. 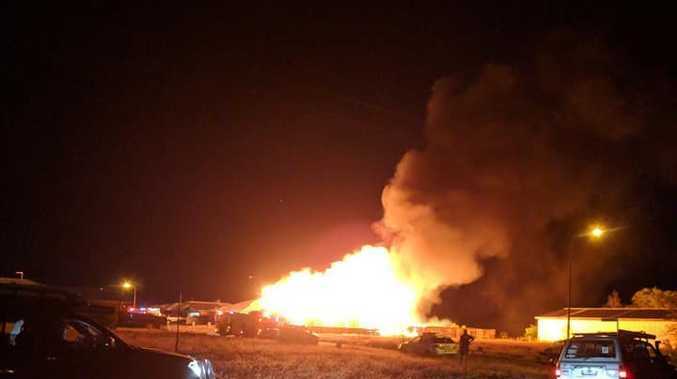 Proponents of the theory have long looked for a "smoking gun" to prove it. Deschamps and Thomson found the statue in a Main Roads Reserve in the Gascoyne region of northwestern Australia. Finn Films' Facebook page asks the question, "how did it end up on the beach?" 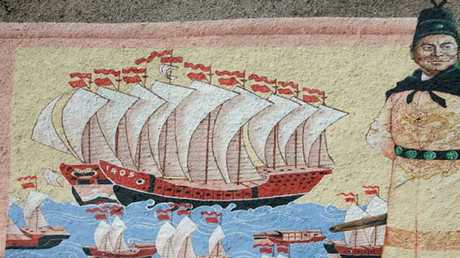 "Were there extravagantly wealthy Chinese traders sailing our coast five centuries ago? "The world's greatest pirate 'Black Bill Dampier' … was it part of his buried treasure and hidden from the English king he was meant to pay tribute too?" "We will follow every lead from Pirate to Pearler to Prince to reveal the story behind the Baby Buddha and perhaps rewrite the history of Australia." The Finn Films documentary recreates French explorer Nicholas Baudin's voyage during Napoleon Bonaparte's reign, to Australia in 1800-1804. The documentary includes a "Time Team" style hunt for equipment believed left in the area by Baudin's crew of zoologists and botanists aboard the ships Géographe and Naturaliste. In 2003, visiting Chinese president Hu claimed his country's fleets visited and settled Australia 600 years ago. Deschamps and Thomson found the Chinese Buddha while sweeping the beach for Baudin voyage objects. Fairfax news reported the men found plenty of beer cans, before getting "a big signal" on the metal detector and unearthing the Buddha. "We brushed the sand away and had a giggle; we thought it might have been a 1950s art deco candelabra or something," Deschamps said. 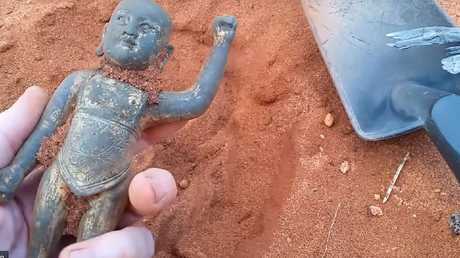 "But in another minute of digging we turned up a baby Buddha." Prospecting or fossicking without a permit in certain areas can attract heavy fines, but the men believe it was a legal find in a Main Roads reserve and the object is lawfully theirs. 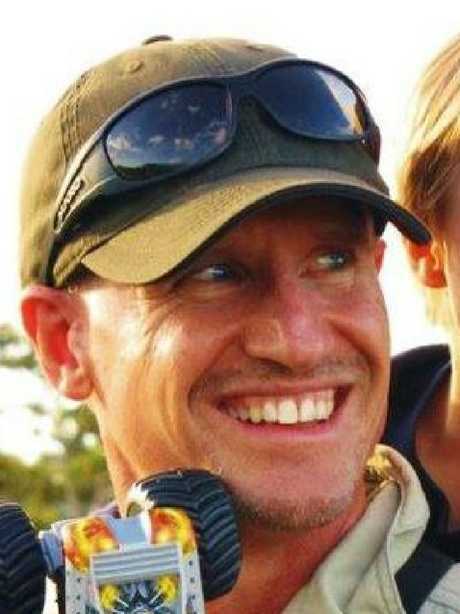 Shayne Thomson told The Australian the claims about the Buddha's origins were part of their documentary's marketing strategy. "It's a little bit promotional, but we just want to get the debate going." Though small, the statue weighs 1kg and some experts say it was made in the early 1400s. 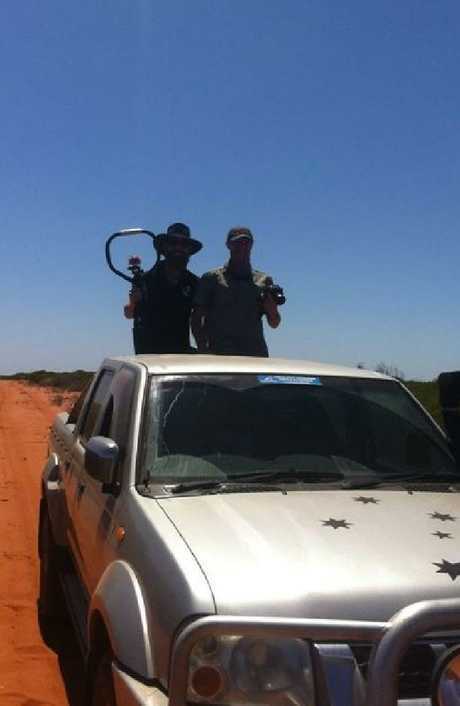 Leon Deschamps and Shayne Thomson (above) found the statue after their metal detector got ‘a big signal’. Discovered near Shark Bay (above) the Buddha’s finders claim Chinese ships reached Western Australia a century before Dutch explorers Dirk Hartog and William Janzoon. Shayne Thomson of Finn Films. Leon Deschamps’ family settled in Shark Bay last century. The discoverers found a lot of beer cans before their metal detector (background) unearthed the baby Buddha.